For future managers, the fast-paced world of technology offers both unlimited opportunities and difficult challenges. Understanding what the laws are, why they're important, and how they apply to cyberspace will help you to make better decisions. 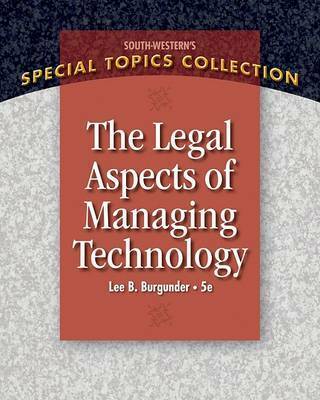 LEGAL ASPECTS OF MANAGING TECHNOLOGY, 5e guides you through the complex legal issues involved with today's rapidly-changing technology environment. This book offers a comprehensive presentation of intellectual property rights and solid coverage of other key topics including ecommerce, privacy, antitrust, and biotechnology. This edition's lively, intriguing writing style is packed with actual examples showing how real companies throughout the country analyze and apply legal concepts. Lee B. Burgunder is professor of law and public policy at California Polytechnic State University, where he has been teaching for 25 years. Professor Burgunder is recognized as a "Distinguished Teacher" at Cal Poly, and is a pioneer in developing technology law courses for undergraduate and graduate programs. He has published numerous articles on intellectual property and technology law issues, and served as co-chair of the technology law section within the Academy of Legal Studies in Business. 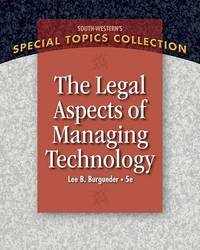 Professor Burgunder received his law degree and M.B.A. from Stanford University, and practiced law at Patton, Boggs in Washington, D.C., prior to entering academia.